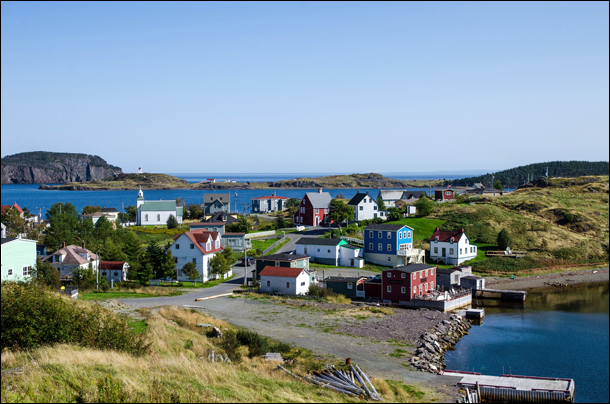 TRINITY, NEWFOUNDLAND & LABRADOR — On more than one occasion, a day-tripper to Trinity has asked Marieke Gow where her home really is. It’s incomprehensible for some that Trinity — with its heritage buildings, utterly charming stores and residents so friendly it’s easy to assume they might be paid to behave that way — could be anything but a manufactured tourist attraction. In fact, it’s a real village, one with a long history and a present that makes it one of the most picturesque towns in Canada. Gow is the marketing manager and sommelier at the Artisan Inn, a property that features six cottages spread through the small town that has all of 36 full-time residents. They live in homes with peaked roofs and brightly coloured clapboards, pretty places surrounded by a small hill and dominated by the spires of a pair of churches. It has a resemblance to Avonlea, the fabricated town in Prince Edward Island made to replicate Anne of Green Gables’ fictional home from the turn of the 20th century. But Trinity also has a touch of Europe and that’s not by accident. Any construction or re-modelling of existing buildings has to resemble those already in place — not that there are any developers approaching the Trinity town council with mega-condominium proposals. While some tourists have discovered Trinity, the town is more than three hours by car from St. John’s. Since the federal government instituted a moratorium on cod fishing 20 years ago, the region’s main industry has struggled and there are few other sectors that can sustain growth. Tourism, though, has blossomed. After the closing of the cod fisheries, the provincial governments offered grants to entrepreneurs who wanted to open businesses. Tineke Gow, Marieke’s mother, took advantage of those assistance programs and began a bed-and-breakfast operation in one property, the historic Campbell House, and quickly expanded as tourists started to arrive. According to statistics from the Newfoundland & Labrador Department of Tourism, “518,500 non-resident visitors” ventured into the province in 2010, an increase of 7.3 per cent from 2009. During 2010, a record year, those visitors spent $411 million, a spike of 9.6 per cent from the prior 12-month period. While the final numbers for 2011 haven’t yet been made public, indications are they will top the 2010 total. Through September 2012, the total air passenger movement in seven of the province’s largest airports was up 8.4 per cent. Travellers have discovered Newfoundland and when they venture beyond St. John’s and Gros Morne National Park, they’ll eventually wind up here, in the stunningly beautiful Bonavista Peninsula, dotted with coves and jagged cliffs, whales and puffins, shellfish and moose burgers, and, yes, screech and seal flipper pie too if you really want. Trinity adds another unique touch with its well-preserved homes and just-so elegance. It was one of the locations used for the movie version of The Shipping News and continues to attract film and television crews — along with more and more tourists. In 2011, the lodgings in the Bonavista Peninsula saw a 4-per-cent increase in occupancy rates and brought in $8.7 million in room revenue, a hike of $1.2 million from 2010, according to tourism board statistics. Trinity, one of about 30 communities in the peninsula, has found itself attracting second-home buyers as well as artists and writers who want to stay for extended periods to explore, work and find inspiration. “It’s like the United Nations here,” notes Margaret O’Dea, a realtor and part-time resident wh0 says the community, which swells to more than 200 during the summer, hosts people from a range of professional and cultural backgrounds. Her husband, Chris O’Dea, points to the community’s camaraderie as a reason to visit. “When we had a storm a couple of years ago that did a lot of damage to Trinity’s roads and knocked down trees, the part-time residents got together to hold a Thanksgiving Day dinner for the full-time residents,” he says. Eric Parsons grew up in Trinity and now lives in a house that’s been in his family for more than a century. A physician, Parsons says the community has shrunk significantly since he was a child, but maintains its idyllic appearance and spirit. “You can travel the world and not find any place like Trinity,” he says with pride. As Parsons cleaned his fish on the town dock one morning, the sun climbed to its apex and the waters of the bay laid flat and blue as an infinity pool in the Caribbean. Around town, the smell of hydrangeas and irises from well-manicured gardens lingered in the air and the cool, clean fall air tickled my skin while at the cozy Artisan Inn coffee brewed and red dock chairs stood empty and waiting, staring out to the water in a place that met the romantic expectations of Newfoundland and also surprised with its ability to sate sophisticated appetites for good food and comfort. In that setting, you can believe Parsons when he tells you that Trinity is hard to fathom and difficult to leave. Rates: Single nights start at $129. Check the inn’s Rates page for details. Dining: The Twine Loft restaurant on premises offers a splendid fine-dining experience that incorporates the province’s abundance of seafood, including shrimp and snow crab. Marieke Gow has put together a solid wine list and a very good Scotch list, as well, including 12-year-old Lagavulin. Note: The inn is closed during winter. When to Visit: While Trinity comes alive in the summer, you might want to travel in May before the crowds arrive. Also, the Roots, Rants & Roars culinary festival is held in September in Elliston (one hour away) each year. It’s a reason to visit the Bonavista Peninsula and Vacay.ca will tell you why in the coming weeks. What to Do: The Rising Tide Theatre features plays, concerts and special events throughout the summer. Take advantage of the Skerwink Trail, a 5.3-kilometre hike outside of Trinity that may include sightings of icebergs, whales and eagles. What Not to Do: Swim. Waste treatment facilities in the region need to be updated and that means parts of Trinity Bay are not safe for swimming. In Elliston, there’s a beautiful beach where swimming is safe — and recommended. Where Else to Stay: The highly regarded Fishers’ Loft Inn is in nearby Port Rexton, close to the start of the Skerwink Trail and also a site of The Shipping News film set. There are about 150 residents of the Municipality of Trinity. Thanks, Joan. According to the townspeople, including a member of the council, there are “36 full-time residents” in the town itself, as the article states. There are numerous part-time residents, which might account for the discrepancy. If you’re certain that isn’t correct, please let us know and we will make the change in the article.